In 2013, Canadian educator Lori Gard wrote a popular piece for Huffpost Living which highlighted caring as the most important thing a teacher can do for his or her students. Two years later, I want to bring the conversation alive again by adding something more than personal experience: scientific research. It’s an inspirational message–one that most of us can agree with and even use as a daily mantra. But what’s even more inspirational is that there’s actual scientific proof that caring does make a difference. Take a look. Researchers at the University of Edinburgh have found that the more a teacher cares about her students, the more respect she will receive from them. By investigating and testing Dennis Wrong’s widely referenced “five forms of teacher authority,” the researchers found a sixth form of authority, “the authority of care,” that appeared to be missing from Wrong’s typology. Wrong, a sociologist who was interested in understanding power relations in general, identified five forms of authority: personal, legitimate, competent, coercive, and by inducement. Personal authority appears to be the most prevalent in educational settings, and describes a scenario in which a student follows directions because he wants to please his instructor. But Doctor Gale Macleod, who co-authored the report, says she and her colleagues found another reason students might choose to respect their elders. Looking across four different settings—at a mainstream school, a youth workplace, an SEBD school, and an outdoor education center— Macleod and her colleagues carried out a series of interviews with staff and young people. Macleod says there is a strong theme emerging in her data suggesting that “young people do what adults ask them when they have a sense that the adult cares for them.” The young people used phrases such as “has our best interests at heart” and the adults who were identified by the young people as “sound” used similar language—they talked about caring for the young people, building relationships over the years (and sometimes across generations of the same family), looking to the future, and caring about outcomes. Another theme to come up was that the young people weren’t only responding to the individual character of the teacher, but to what that teacher represented in broader social terms, including gender, class, and age. To gather data for their study, the researchers interviewed teachers, conducted sit-in observations, and asked for self-reflections from teachers at suburban institutions in the southern part of the United States. Campus administrators provided the names of individuals they perceived as caring teachers and briefly explained their choices. The researchers selected four participants who were perceived as being compassionate and had a reputation for establishing nurturing and caring relationships with all students by campus administrators. The participants included an African-American, Hispanic, Korean, and white female educators. Their ages ranged from early 30s to over 65 years old. Teachers in this study fostered a sense of belonging by promoting a sense of community, providing positive nonverbal communication (making eye contact and smiling), refraining from nonthreatening verbal communication, conveying a positive disposition toward students, and using proximity to support students. The educators in the study believed that caring for students included talking directly to students as a group, but more importantly, making individual contact. The conversations between teacher and students were personal in nature rather than about grades, missed assignments, or homework. Statements such as, “Hey, you okay?” “How was your weekend?” and “Is everything going all right with you?” reflect the teacher’s sincere interest in her students. These positive interpersonal behaviours, where teachers spend time talking to students about their personal or social issues, promote a sense of belonging and strengthen a bond between teacher and student. According to the researchers, getting to know students personally refers to knowing about students’ academic, socioeconomic, and social backgrounds. During the interviews, the four teachers expressed that caring was critical for a successful teacher-student relationship. Caring about students extended beyond classroom observation; outside information was gathered to assess student learning needs. “I find out if there are issues affecting students’ learning and I am sensitive to family emergencies when students get behind or fail to complete assignments,” stated one teacher. The teachers also believed that showing concern for the students’ cognitive needs was one way to care for students. Talking to students about their interests and listening to students are ways to convey a caring ethic . In contrast, students who perceive an uncaring teacher are more likely to be academically distant. Teacher behaviors perceived as caring attributes in this theme include verbally communicating high expectations with students, expressing positive statements to encourage student effort, monitoring and assisting students during learning activities, and individualising learning outcomes. If students perceive they can complete a task successfully, they are more likely to continue on task. During the interview, all four teachers expressed that demonstrating caring actions spurred students to greater personal and academic accomplishments. One teacher expressed that some students are allowed to complete fewer assignments whenever they demonstrate an understanding of the “big picture.” This is an example of differentiating instruction for students to meet their individual academic needs. Rather than requiring a student to meet an assignment quota, the teacher makes an instructional adjustment based on what is academically sound for the child. This behavior enhances the culture for learning by demonstrating to the students that they are cared about and their academic success is a priority. “It is interesting that both teachers and students perceived a focus on student comprehension and academic scaffolding during a teaching episode as forms of caring,” the authors write. Responding to students’ needs by supplying the necessary resources demonstrates a way to help them feel wanted and nurtured in a safe climate. Places of learning need to become caring communities because “for too many young people, the home is no longer a place of security and love but a battleground where economic and emotional survival is a daily reality.” This last theme reflects the teachers’ moral and ethical commitment to care for their students in ways congruent with their own espoused belief about caring. Earlier this year, Utah State University PhD candidate Andrew S. Larsen published a graduate thesis entitled, “Who Cares? Developing a Pedagogy of Caring in Higher Education.” Interviewing twenty university students and ten professors, Larsen was able to identify the following eight measures of caring as most important in a higher education setting. The first was knowing students’ names. When professors reach out to students by showing genuine interest in their lives, Larsen says, those students perceive care. Professors who ask questions about students’ lives, show interest in what interests them, and seek to know them better display the kinds of relation building behaviours that foster perceived care. Smiling and eye contact were repeatedly mentioned by students during interviews and journal recording, Larsen says. In addition, tone of voice that implied enthusiasm, excitement, and enjoyment promoted perceived care for students. Caring also shows up as a key component in a multidimensional model of motivation that can be used to engage students: http://www.theMUSICmodel.com. This was a very interesting article. I have taught in a small community for 22 years, so my experience is in no way statistically significant. Even so, I believe this article was spot on. 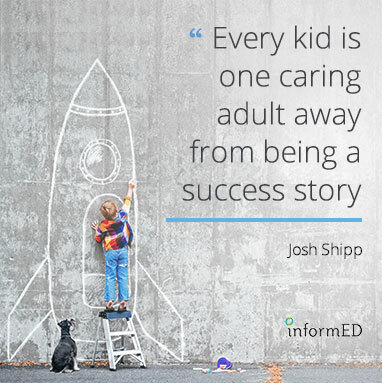 It has been my experience that students do not mind working for someone that they believe cares about them.